Wood is very suitable for processes involving engraving, cutting and marking with a laser. Cutting: laser can cut wood perfectly without leaving splinters or damaging the edges or surfaces of the object. The cut is clean, smooth and precise and it is possible to create very complex shapes and let the imagination run free. Engraving and marking: laser can engrave and mark any type of wood (including solid wood, MDF and veneer sheets). The incision appears darker, because of the micro-combustion of the wood. Thanks to the extreme versatility of the equipment, it is possible to choose the depth of the engraving and to correct it during the processing phase. The contrast of light and dark derived from laser engraving is much sought after. The natural grain of the wood can create a very attractive image. Anodised aluminium: laser engraving and markinig can accentuate the colour of metal, creating a very pleasant, clearly legible and contrasting image. Laser marking is common used for insignia, badges, plaques, key rings and any object with a promotional and informative purpose (barcodes, QR codes, progressive numbering, and technical and variable data) and/or decorative purpose (graphic elements and images). Each line engraved on metal is permanent and abrasion-resistant and can produce a non-falsifiable and unique mark. Brass and copper: on these materials, it is also possible to engrave using a laser, creating a contrast between the gloss of the material and the opaque incision, which can also appear black in colour. Steel, iron: in additionin to the engraving we have already described for the other metals, these materials can be cut and shaped up to a maximum thickness of 1.4 mm. CO2 laser can be used to engrave any graphic element on glass or crystal, for example, an image or simple writing. Its engraving is perfect, clean and does not cut. The treated part of the glass takes on a delicate, satin appearance. The printed image is resistant to water and all environmental conditions and does not fade even after the use of the most aggressive solvents. Your sign will remain indelible and constant over time. We can cut all plastics, with the exception of PVC. Our many applications include the cutting of polyester and polycarbonate faceplates and panels for small-scale production, therefore eliminating expense die-cutting. The cutting and engraving of multilayer materials such as Metallex and the processing of methacrylate which, because it is one of the most elegant and sophisticated plastics, is used in various fields. Plexiglass is extremely versatile, because it is as transparent as glass and as durable as plastic. Like glass, it can also be engraved and cut using laser. By properly calibrating the beam at the source, it is possible to execute clean cuts and transfer vector designs and bitmap images. Rubber engraving is very useful for making packaging for fashion accessories. Rubber processing is particularly useful for industrial processes that allow the laser to be produced in shorter runs. In this way, fewer items can be produced, without the need for the production of a series. not require further processing to remove small pieces of waste paper and hole sizes can also reach infinitely small diameters. 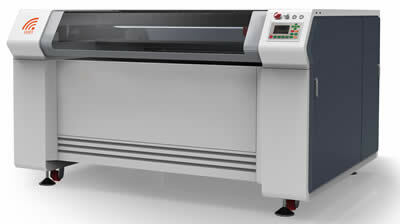 When a perfect cut or scoring is required on particularly “difficult” fabrics, laser is the ideal solution. Cutting is clean and, because of the heat produced, profiles do not fray or create fringing. Any type of fabric can be cut or scored, from filter cloth, non-woven fabric (NWF), linen and insulation material to cotton and jersey. Any type of fabric can be punctured and micro-punctured without leaving any material residue (fibres or yarns) on the opposite side of the incision. During the laser processing, fabric is subjected to high temperatures that completely eliminate any trace of superfluous material. Laser allows non-contact processing and is a very useful solution in the case of colour textiles and fabrics with delicate textures that risk being ruined by contact with tools. Laser cuts skin and scalp perfectly, as if it were a sheet of paper. Laser incisions produce a burning or branding effect and perfectly follows the incisions made using traditional marking tools. Laser is indelible and everlasting. It is also extremely precise when engraving writing, designed images and scored logos. Innumerable leather and hide items can be processed using laser, as well as a wide range of clothing and furnishing. Two of the most common laser processing methods for leather and hide are without a doubt the engraving and marking of labels for applications on jeans and T-shirts. Engraving on marble and granite is used in applications such as signs or funerary stones.